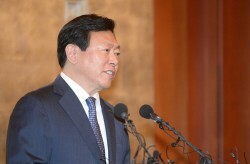 Lotte Group Chairman Shin Dong-bin answers to reporters' questions after announcing his public apology and pledging to making the group's murky governance..
Will Xiaomi build smartphone plant in India? By Ha Man-joo, India correspondent, AsiaToday - Chinese smartphone maker Xiaomi will likely build a plant in Andhra Pradesh State in India. Its recent act..
By Ha Man-joo, India correspondent, AsiaToday - Foxconn has finally confirmed its investment plan in India on Saturday. It will invest $5 billion over five..
Rajasthan Chief Minister Vasundhara Raje (Center) and other attendees are clapping at the MOU signing ceremony on investments at the 'Rajasthan State Inves..
By Ha Man-joo, India correspondent, AsiaToday - Foxconn Technology Group is set to invest $2 billion in building manufacturing plants in India over the nex..
On June 6, Indian Prime Minister Narendra Modi was seen getting off the plane for a visit to Bangladesh. 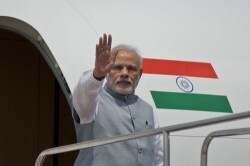 Prime Minister Modi, who recently completed.. 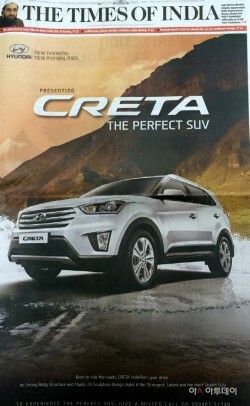 The front page advertisement of Creta, a compact sports utility vehicle released by Hyundai Motor India on July 21, has been published on Indian leading ne..
By Ha Man-joo, India correspondent, AsiaToday - Maruti Suzuki India Ltd, India's largest carmaker, posted a 56 percent increase in net profit for the secon..
Hyundai Motor India is promoting recently launched compact SUV Creta through TV, newspaper, online, and outdoor signboards. The photo shows an outdoor sign..
On July 24 (local time), Chief Minister of Mizoram Mr. Lalthanhawla & Mrs. Lalthanhawla, singer Jung Hye-min (center), and Indian correspondent Ha Min-..